The Franklin is a charming provincial home with 4 Bedrooms and 4 ½ Baths. Nestled on over an acre of wooded land minutes from downtown Saratoga. This home has an open and spacious layout with most of the living space on the 1st floor. The distinct custom kitchen boasts a wood hood, an additional wall oven, and a large functional island with seating. The family room is spacious with a gas fireplace and vaulted ceiling overlooking a great for entertaining screened porch. The elegant Dining Rm has a trayed ceiling and feature wall. The study is located off of the foyer with glass doors and built ins. The 4th bedroom is located upstairs with a full bath creating a nice guest suite. This home dazzles an elegant Master suite on the main floor that has a sitting area, and large master closets with custom shelving. In addition there is a separately attached 3rd car garage, and finished basement with 3/4 Bath. 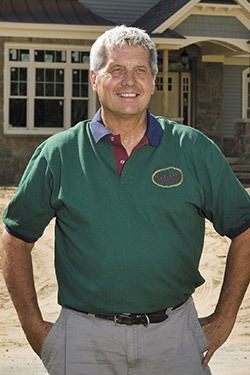 RJ Taylor Builders, Inc. is a family owned and operated award winning custom home builder. We pride ourselves on quality craftsmanship and attention to detail. Our hands-on approach to the building process gives comfort to our clients, and we guide them every step of the way to create a custom residence that reflects their individual style. Our Distinct homes are designed in house to provide a functional interior layout to accommodate all lifestyles from, young professionals, families, to empty nesters. With our innovative designs and use of superior products RJ Taylor is well known in the industry for quality and has earned a suitable reputation in the capital region and an abundance of knowledge building over the last 40 years. Interior Design Firm: RJ Taylor Builders, Inc.